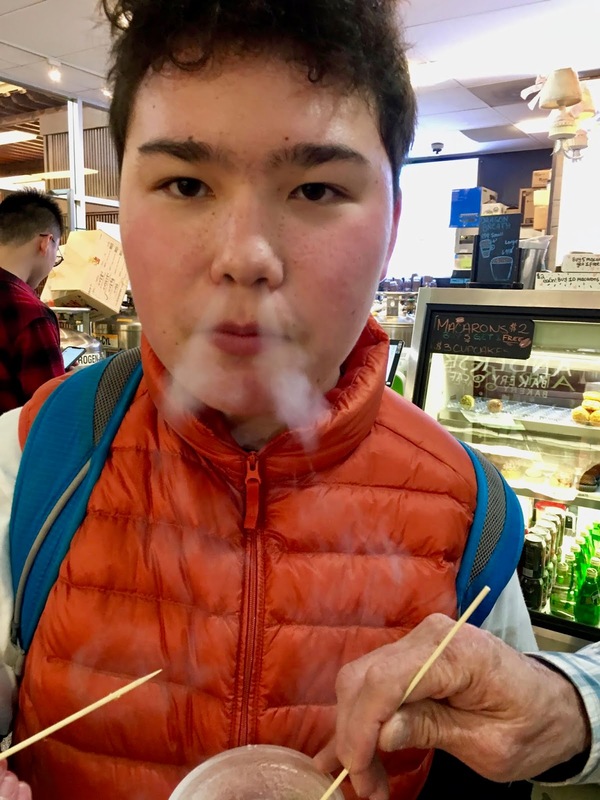 One dad's experiences as the father of a dynamic 14 year old boy with autism. We had a leisurely morning at the lodge near Yosemite before heading out. The lodge has a game room and the evening before we had played table hockey and pinball. In the morning, it was far less crowded and we were able to play some billiards. I'm not very good at all, but Kai wanted to try it and I tried to give him some pointers. And then we began our journey back to San Francisco where we will stay for one night before flying home. 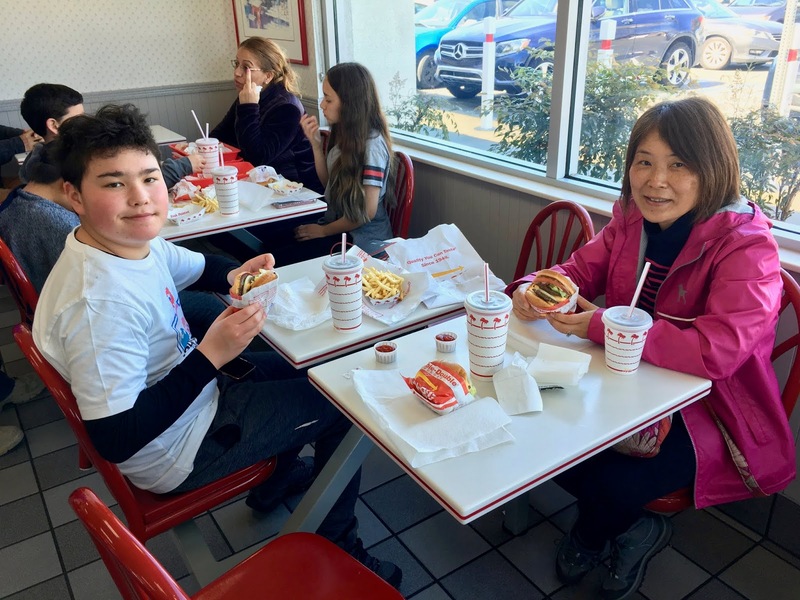 For lunch, we wanted to eat at the popular California burger chain, In-N-Out Burger. It was crowded and we had to wait a while for our food but we thought the burgers were good. The drive back was mostly uneventful, with the biggest problem coming when traffic was backed up about an hour to get through the toll at the Bay Bridge. With about 15 lanes of traffic narrowing down to five lanes on the bridge, it wasn't a surprise that traffic would crawl on a beautiful Saturday afternoon. 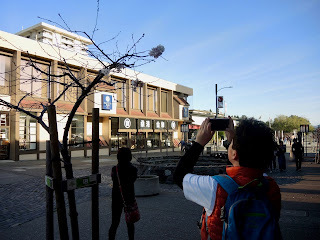 Back in San Francisco, we stayed at a hotel in Japantown. 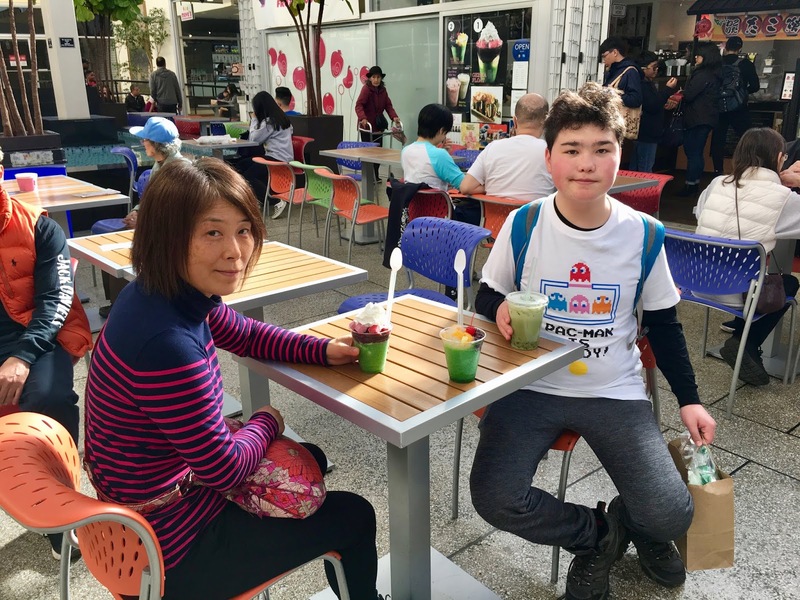 Japantown is only a few blocks long, but there is a concentration of Japanese restaurants and shops. Kai enjoyed shopping for plushes. It was funny that at one shop, he actually got into a brief conversation with a woman when he proclaimed that "everything here is overpriced and fake" and the woman agreed with him. But he still found one plush that he bought to take home. He also liked seeing cherry blossoms, Japanese sculptures, and other Japanese items in the neighborhood. 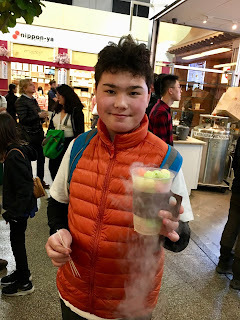 We had matcha drinks for a snack. We had looked forward to having a nice Japanese meal for dinner, but was again hugely disappointed. The restaurant we picked was rated as the top one in Japantown on TripAdvisor but I'm not even going to show any pictures of the place. The edamame was overboiled and tasteless, the service was slow with our takoyaki not coming until well after we finished the rest of the meal, and the place was very loud. At least the sushi tasted better than the place we had gone to a few nights before. However, we did find a fun spot for dessert. In the mall there was a place selling dragon's breath, a frozen dessert made from cereal dipped in liquid nitrogen. When you eat this, it produces vapors which comes out of your nose and mouth, hence giving the name dragon's breath. 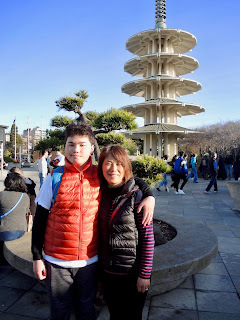 As we walked back to our hotel, Kai said that he really liked San Francisco. He said it was one of his favorite cities and he would like to live here. And so this vacation went pretty well overall. There weren't any big challenges like we had in Japan last summer. So maybe we'll give this vacation thing another try. I am glad Kai likes SF. I have really loved it since I was 6 years old when we moved back from Japan and settled in Santa Clara (45 minutes from SF). I personally do not like In-And-Out Burgers. Perhaps it was just the particular outlet I had tried, but I had found them to be tasteless. I was also disappointed in some of the restaurants in J Town in SF. The J Town in San Jose had far superior Japanese restaurants when I was young...although SJ’s J Town is all but dead now. The main dish I judge Japanese restaurants by is their beef sukiyaki. I have only found a few which even serve it...and far fewer who make it right. I had never heard of that dessert before. You captured the dragon’s breath just right in your last photo. You had planned your vacation well. I am especially glad Kai enjoyed himself. San Francisco has been one of my favorite cities, but I can't always predict what Kai will like so I was very happy that he enjoyed the city so much. Usually he looks forward to coming home, but today he seemed a bit sad to leave. 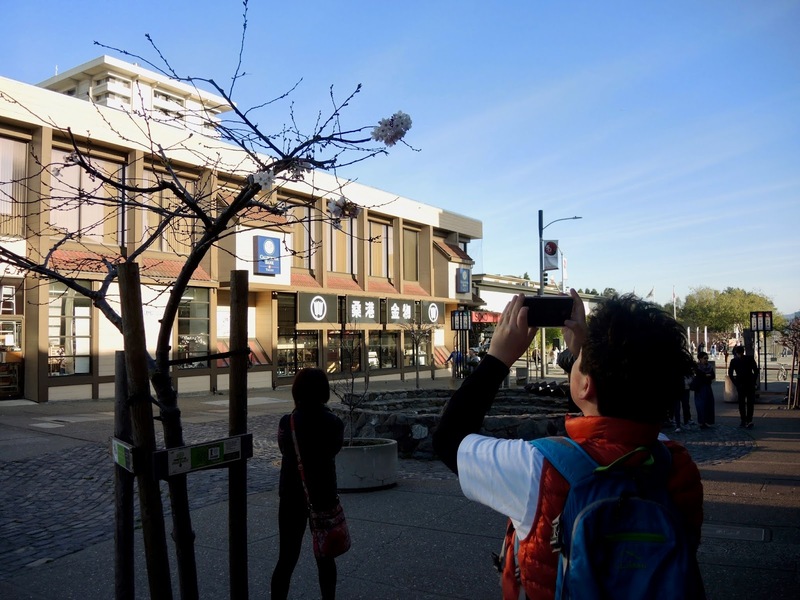 We wanted to see Japantown, partly because there are so few in the US. Maybe next time we'll get down to San Jose although, as you say, that may be dying out as well. I am a lifelong Chicago-area resident. My interests in sports, pop culture, movies, and politics have taken a back seat to being Kai’s dad. © 2010-2012 Yuji Fukunaga. Simple theme. Powered by Blogger.